My dog has ear mites and the stuff I picked up at the store is not working! This is a scene played out daily at the Jefferson Road Animal Hospital and at every veterinarian's office in Kokomo, Indiana. Ear mites are by many thought to be the only cause of ear problems in dogs and cats. While quite common in cats, they actually are quite rare in dogs. Most of the dogs diagnosed with ear mites recently came from a puppy mill, or pet store or are living in a home with multiple cats. 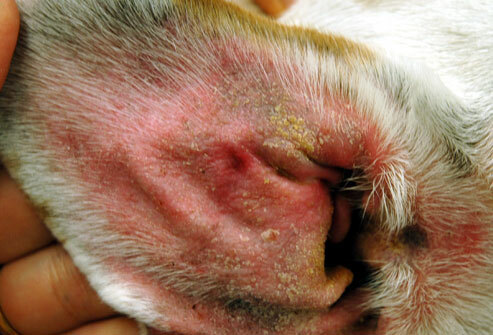 The picture below is a typical inflamed ear from a dog. This one happens to have been diagnosed as a yeast infection, but quite frankly, without making a slide and examining the specially stained contents under a microscope it is impossible to tell. Most dog ear infections are caused by chronic inflammation from allergies. This is why many of you may have experienced that if you have a dog with ear infections, they seem to occur several times a year. Treating ear infections requires identifying the root cause of the problem and then developing a long term plan. Dogs and cats can be allergic to many things in our environment like pollen, mold spores and even things like house dust mites. Food allergies can also cause ear inflammation but this is much less common. Even if your pet does have ear mites, pictured above, most over the counter products are not very effective because they do not kill the eggs. The adult mites burrow into the skin lining the ear canal and deposit their eggs. The over the counter drops only kill adults. The eggs can take 21 days to hatch so unless you treat the ears every day for 3 -4 weeks you will never get rid of them. There are several products now available from your veterinarian that are used topically that can rid the pet of ear mites in 1 or 2 doses. Bottom line, if your pet experiences ear problems they really need to be examined so the actual cause can be identified and treated appropriately.